Have it under control everywhere. Netilion Health empowers you to be ready and effective in case of unexpected events in your plant. With Netilion Health you have essential know-how right at hand, no matter where you are. Start now to see the ease of asset maintenance, it’s free. health conditions available for you. A health condition describes the cause of a diagnosis code and instructs how to remedy the problem. With Netilion Health you have access to in-depth knowledge in maintenance and care on your assets. Asset maintenance is made easy. When an unexpected event occurs on a key component of your production line or plant, it is crucial to act very quickly. The traditional control and asset health management systems may inform us in real-time about the status of the assets. However, it is often necessary to be on the spot and when something is reported, the most important thing is missing: the instruction how to solve the problem. That's what Netilion Health is all about. Netilion Health provides, wherever you are, a deep source of knowledge related to the maintenance and care of your assets. This way asset maintenance becomes easy for you. Start with Netilion Health and access a wide source of in-depth knowledge of the maintenance of your assets. Welcome to the new age of asset maintenance. 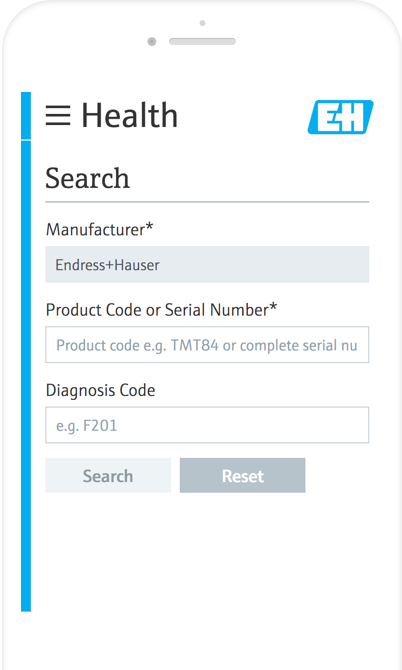 There's nothing simpler: enter the diagnosis code displayed on your instrument and receive instructions on how to resolve the fault. With Netilion Health you no longer need to look for things up in the manufacturing documentation - the information is directly in your pocket. A valuable gain in an emergency situation. Asset maintenance made simple. Combined with an edge device, you unlock even more potential and get a real, hands-on connected solution. "With Netilion Health, I know that I have all the information I need to solve possible failures. No need to run and look for documents. It's right here in my pocket." Search for your asset on your smartphone, tablet or laptop. Enter the error code and directly access precise information provided by the manufacturer with steps on how to resolve the fault. A graphic overview of events occurring in different intervals allows you to understand more about a situation. Trace your key components and see their health history for deeper insights for easily handling the challenges of asset maintenance. Connect your assets with the Netilion Health service via one or more edge devices and benefit from a real and concrete connected solution offering a multitude of new possibilities of asset maintenance. The edge device is available optionally in the plans Plus and Premium. *For more information on the pre-conditions to use an edge device: click here . Many people are already using the Netilion Health service for their asset maintenance. Find out why.